Ubisoft has announced that it will not be publishing the Xbox 360 and PS3 versions of No More Heroes. 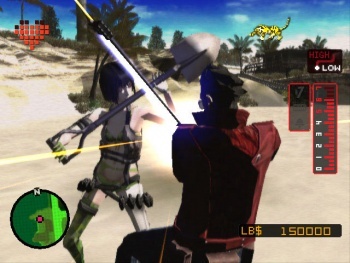 Suda51's No More Heroes was an oddity in almost every way. Not only was it satirical and often incredibly bizarre, it was also a violent and very adult game for the Wii. No More Heroes was published in the US by Ubisoft, the publisher has announced that while it will still be publishing No More Heroes 2: Desperate Struggle in January, it won't be releasing the HD Remake No More Heroes: Heroes' Paradise. "Ubisoft will not be publishing either of these versions," a company spokesperson told G4. Given that the game feels a better fit for the 360 and PS3, Ubisoft's decision to pass on Heroes' Parasdise seems an odd one. The company gave no reason for its decision. All is not lost however, as Ubisoft's decision does not prevent the game from seeing a North American release, but it does mean that a new publisher must be secured.